Each new year I choose a word to serve as a theme for the upcoming 12 months. The process is intuitive, more art than science. The word actually chooses me. Last January it seemed no word wanted me when voila! effloresce claimed me for 2013. It means 'to burst into bloom,' and I feel as if parts of my life did just that this past year. This year no sooner had I begun the word search when 'RIPENING' swept me off my feet. Of course, all those places in my life that bloomed last year are now beginning the ripening process. Much like this bunch of grapes some parts of my life feel already full and ripe; others are still becoming, still RIPENING. 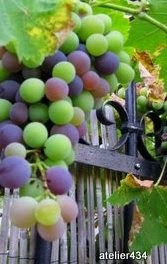 That's how life should be...always in the process of RIPENING, of getting fuller and lusher and sweeter. Watch me as I ripen in 2014!